Instant Instant Pot Dal Tadka, or Indian Dal Fry with Rice is an easy pressure cooker recipe for a hearty and delicious one-pot Indian meal. 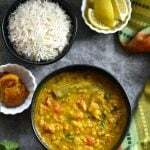 Split Pigeon Peas, or, Toor Dal lentils are flavored with aromatics & spices, and cooked with pot-in-pot basmati rice. 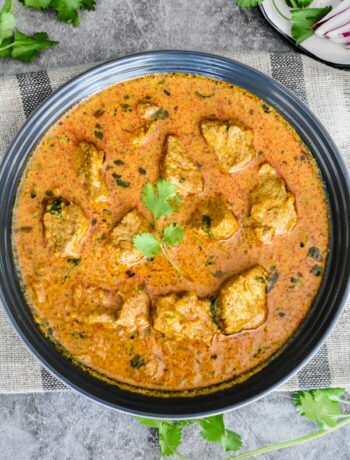 Enjoy this popular Indian comfort food with this 30-minute recipe. 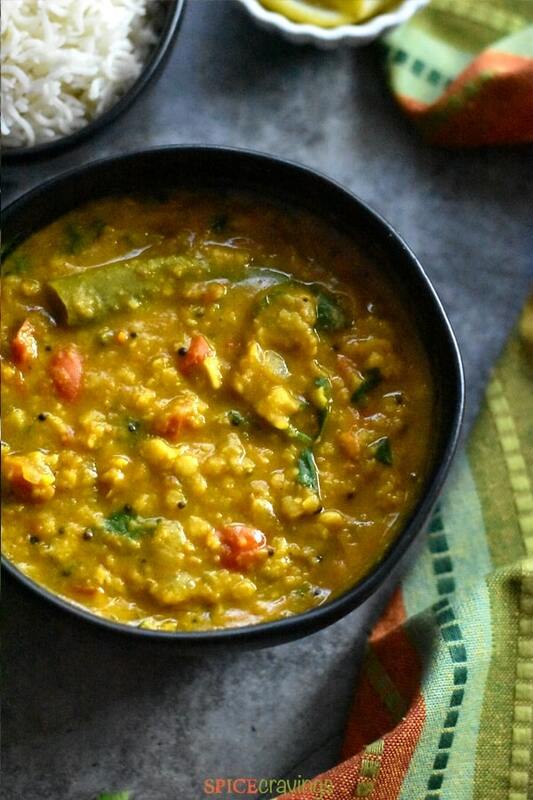 Dal and rice are pure comfort food in most Indian homes. 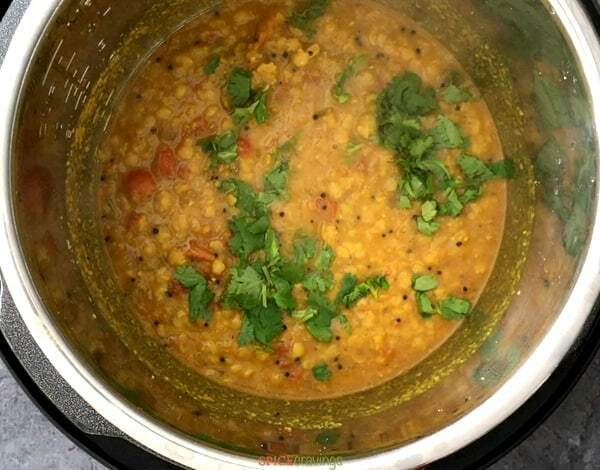 Toor Dal, also called Arhar Dal, is probably the most popular lentil all over India. It’s a staple for many households and is made daily in some homes. The creamy texture of this light and flavorful lentils places it among the soul foods in Indian cuisine. To make Dal Tadka, or Dal Fry, I cook the lentils with sautéed onions, ginger, garlic and tomatoes, and season it with toasted garam masala. 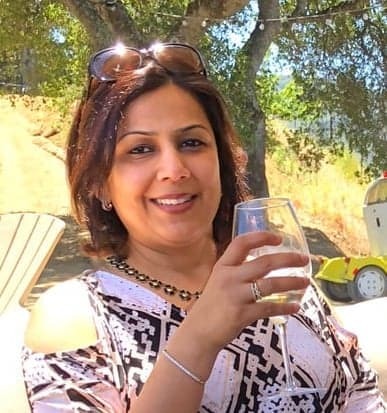 In this easy Instant Pot recipe, I cooked dal & rice together, using pot-in-pot (PIP) cooking method, to make this a convenient and complete one-pot meal. Dal, also spelled as Daal, Dhal, or Dahl, are dried pulses and belong to the legumes family of dried peas, beans and lentils. They can be whole or split, and are staples in many South Asian countries, including India. Dal is naturally Vegan and Gluten-free and is a great source of proteins, carbohydrates, fiber and many essential vitamins and minerals. The cook time of Dal varies and depends on the kind and age of lentils. I like to use a pressure cooker for cooking lentils, because I can cook all split dals (lentils) in 30 minutes or less. Plus, most of it is hands-off cooking time. Traditionally, the cooked lentils are flavored with a hot tempering called tadka , which is made by heating cumin or mustard seeds in hot oil or ghee, till they sizzle. Dried red chillies are often added too. This process helps the seeds and chillies bloom, bringing out their flavors and infusing the oil with them. In this lentil soup recipe, I cooked the Dal along with the tempering, to make this a one-pot meal. This recipe is a combination of my mother’s Dal Tadka Recipe and my mother-in-law’s Dal Fry Recipe, so it is the best of both worlds for me! Heat oil on Saute mode (high). When it displays ‘hot’, add mustard seeds (or cumin seeds). Wait for them to sizzle and splutter and add onions, green chilli and crushed ginger and garlic. Saute for 30 seconds. Add chopped tomato and spices and saute for 30-45 seconds. This helps the spices bloom. The tomato also helps deglaze the pan. Add rinsed lentils and water. Using a wooden spoon or spatula, deglaze the pot, scrapping off any brown bits at the bottom. This step is very important to avoid the burn message. If you’re not making rice with it, close the lid, cancel saute and pressure cook for 6 minutes. If you like a more mushy dal, increase the time to 8 minutes. When cook time is up, wait for 10 minutes and release the remaining pressure by turning the knob to ‘venting’ position in DUO, or, pressing down the pressure valve in ULTRA. Open the lid after the pin drops. Assemble the dal as per instructions above. Now, place a trivet in the Instant Pot. In an oven safe bowl that fits, add rinsed rice, water and seasoning. Stir everything. Place the bowl on top of the trivet. Close lid. Pressure cook for 6 minutes on Manual or Pressure Cook setting. After cooking, wait for 10 minutes and release the remaining pressure by turning the knob to ‘venting’ position in DUO, or, pressing down the pressure valve in ULTRA. Open the lid after the pin drops. Remove rice and gently fluff with a fork. Garnish dal with lemon and cilantro and serve warm. 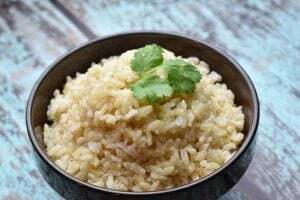 Here is a simple and easy recipe for cumin flavored Rice, called Jeera Rice. If you like to Enjoy Dal Tadka with Brown Basmati rice, here’s the recipe for Brown Rice. Since Brown rice take 22 minutes of pressure cooking time, it is not recommended to cook them pot-in-pot with Dal. 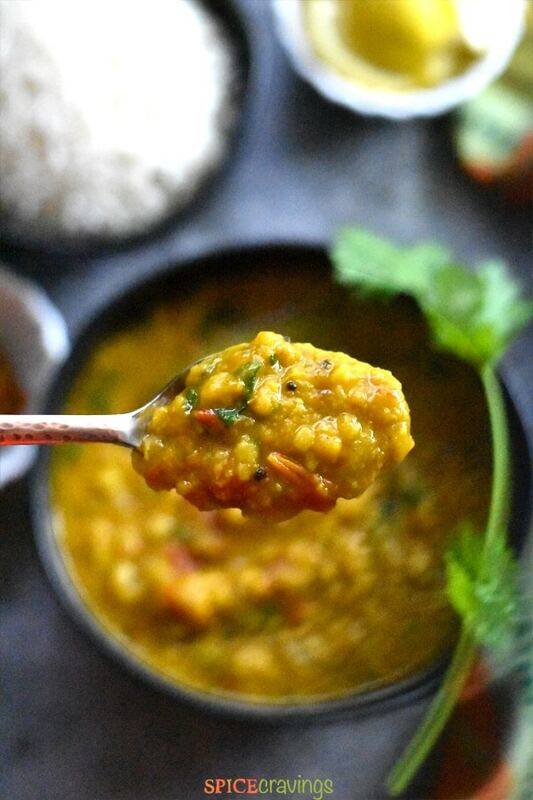 Sweet, spicy and super lemony, this pickle is the perfect accompaniment to Dal and rice! 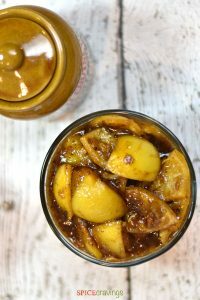 Here’s the lemon pickle recipe. 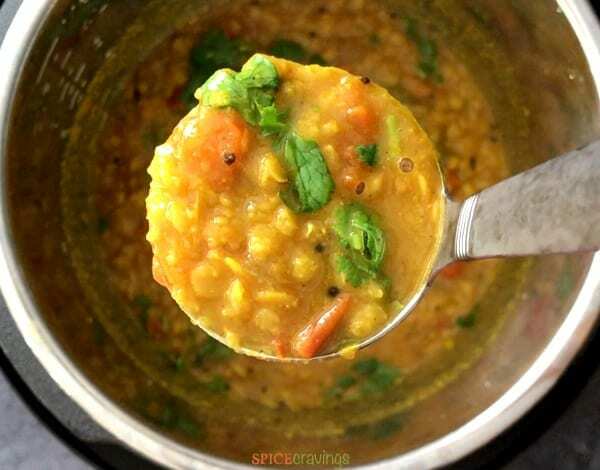 Instant Pot Dal Tadka with Rice, is a delicious one-pot Indian meal. Lentils are flavored with aromatics & spices, and cooked with pot-in-pot rice. Rinse and soak lentils in tap water while you prepare tempering. 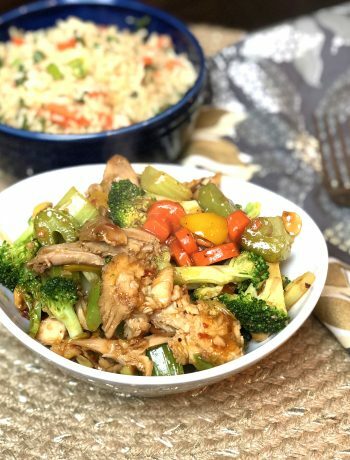 Turn on Instant Pot on SAUTE (high). When it displays ‘hot’, add oil, mustard seeds (or cumin seeds). Wait for them to sizzle and splutter. Add onions, green chilli and crushed ginger and garlic. Saute for 30-45 seconds, till the onion turns pink. Add rinsed lentils and water. Using a wooden spoon or spatula, deglaze the pot, scrapping off any brown bits at the bottom. This step is very important to avoid the burn message. If you’re not making rice with it, close the lid, cancel saute and pressure cook for 6 minutes. For Making Pot-in-Pot Rice: Place a trivet in the Instant Pot. In an oven safe bowl add rinsed rice, water and seasoning. Stir. Place the bowl on top of the trivet. Close lid. Pressure cook for 6 minutes on Manual or Pressure Cook setting. After cook time is up, wait for 10 minutes and release the remaining pressure by turning the knob to ‘venting’ position in DUO, or, pressing down the pressure valve in ULTRA. Open the lid after the pin drops. Remove rice and gently fluff with a fork. Garnish dal with lemon and cilantro and serve warm. Sauce pan: Heat a heavy-bottom sauce pan or a dutch oven, on medium-high heat. Follow steps 1, 2 and 3. Reduce heat to medium and cook the lentils for 20 minutes, covered, or until cooked through and soft. 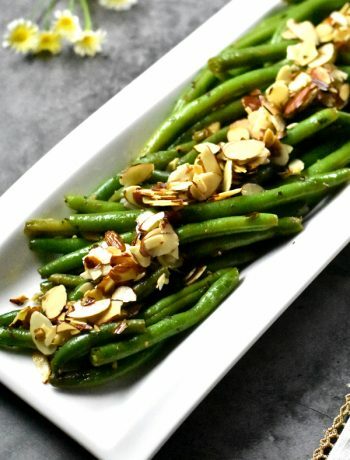 Garnish with lemon and cilantro and serve warm. Indian Pressure Cooker: Follow steps 1 and 2. Close the lid of the pressure cooker. Cook on high-heat till 1 whistle and then reduce to medium heat and cook for 5 minutes. Wait for pressure to release naturally before opening. Continue with step 3. This looks really great. Was going to make it tonight but I read the recipe up, down and sideways and can’t find the amount of rice and water to use for the pot in pot. Did I miss it somehow? Thanks! Hi Lori, sorry about that! 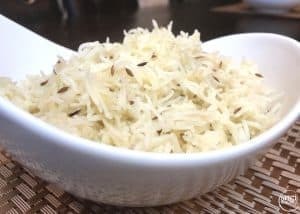 I have updated the recipe card with the PIP rice details. Hope you enjoy it! This was delicious! Super simple to make. Hi Ian, I’m so glad you enjoyed this recipe! If you enjoy lentils, do try Misir Wot (Ethiopian red lentils) and Dal Makhani (Madras Lentils) too. Thanks again, for sharing your feedback!